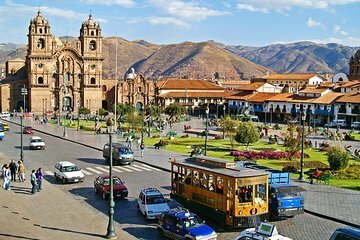 Desmarque mais atrações de Cusco em menos tempo em um city tour privado de meio dia, projetado com os aficionados por história em mente. Com um guia particular, você visitará antigos sítios arqueológicos incas como Sacsayhuaman e Tambomachay; explore o Centro Histórico de Cusco, um Patrimônio Mundial da UNESCO; e admirar monumentos como Cusco La Catedral e o Convento de Santo Domingo. Hotel pickup e drop-off estão incluídos. This was our second tour with Richard and again he delivered an amazing tour. He has the ability to explain what you are seeing so that the history of this area comes to life. We saw many sites on this tour but never felt rushed. We would highly recommend this company for any tour of the Cusco area. Highly recommended - tour guide provided transport to each of the major attractions and provided detailed and insightful knowledge of each site. We also had the opportunity to spend as much or as little time at each site. Highly recommend exploring the sites of Cusco with a tour guide to truly understand the historical significance of these amazing sites. Richard was an expert tour guide. He spoke English well, and he knew the area and the facts. He was congenial and interesting and fun to be with. He called us the night before the trip in our hotel just make sure we were square on start and end times, since we were flying out of Cusco that afternoon. We highly recommend him! Pleasant and informative. The private guide was on time and accommodating. Particularly good if you do not have much time to spare while visiting Cuzco. Absolutely amazing tour! Our guide was very knowledgeable, and very accommodating! I would definitely recommend this tour to anyone traveling to Cusco.